Nanny Vs. Daycare - Which One Is Right For You? 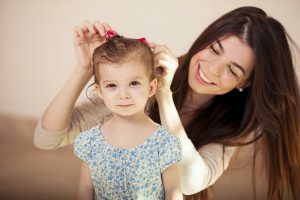 Blog › Nanny Vs. Daycare – Which One Is Right For You? Nanny Vs. Daycare – Which One Is Right For You? Deciding on the perfect childcare situation for your family is a very personal decision and the answer will be different for almost everyone. Every family dynamic is as unique as a fingerprint. Whether you’re aiming for part-time or full-time care, there comes a time in every working mom’s life when she asks herself an important question: What are the best childcare choices for my child? Ultimately, while many may think the decision to choose a nanny or daycare hinges on what’s best for the child, what’s truly most important is what’s best for both child and parents, especially mom. One of the most difficult aspects about having a child in daycare is the dreaded “sick call.” There are germs. Millions of GERMS! No matter how diligent a daycare can be about scrubbing down toys, walls, beds, changing tables, countertops, and everything else in sight, there will always be germs and runny noses. Always! In addition, most daycare centers may not allow you to send your sick child to the center, meaning you’ll have to pay extra for a babysitter or miss a day of work. When you work with a nanny agency, you’ll never have these problems as your nanny will arrive whether or not your kids have a cold. In addition, there won’t be other kids around that will bring in germs that can make your child sick. Your nanny is focused on your child’s individual needs. There is no competition for attention and the nanny can solely concentrate on your child’s development. That means your children will receive plenty of one-on-one attention. This is especially important for newborns and toddlers. With a nanny, your child will receive the attention and care they deserve. Having a nanny come to your home makes being a working parent much easier. If you forget to do something at home, you can call your nanny. If you are having a repairman come to the house, your nanny can be there to let him in. Further, many nannies help with light housework, cook your child’s meals and do their laundry. These tasks lessen the parenting load for you. With a nanny in your home, parents have more control over what their child is exposed to, where he goes, what he eats, and what his schedule looks like. Most nannies provide detailed reports of the day and send parents’ pictures. If this is important to you, a nanny is a good option. Most nannies stay with their families from birth through school age. Turnover at daycare centers tends to average at least one caregiver leaving each year or sooner which may be emotional for your child. Daycare can be overstimulating and overwhelming for some children. The number of children and amount of activity going on can be too much on some days. With a nanny in your home, you can avoid this struggle. Your child can take things at their own pace. On days they feel up to it, your nanny can take your child to a local park or library where they can interact with other children. When you hire a nanny from The Hazel Agency, you can count on your nanny to prepare age-appropriate activities. As your nanny gets to know your child and their preferences, the activities will be ever more tailored to their needs and interests. The Hazel Agency offers a range of nanny services. Whether you need a newborn care specialist, part time nanny, full time nanny, live out or live-in nanny, we can accommodate your needs. With our rigorous certification process, you can be sure that your nanny will meet the highest standards in childcare. Choose a nanny over daycare for peace of mind, convenience and high quality care. Contact us today (770-643-2034) to discuss your needs!